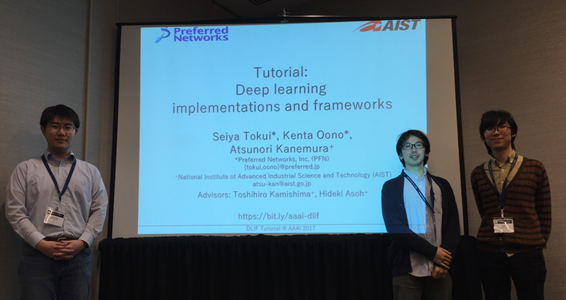 [San Francisco, February 5th] Preferred Networks members, Seiya Tokui and Kenta Oono, gave a tutorial titled “”Deep Learning Implementations and Frameworks (DLIF)” at an international conference (AAAI-17). The presentation slides and sample code can be found here. AAAI has more than 30 years history as a prestigious academic conference in artificial intelligence. It hosted 24 tutorials this year, with diverse topics from machine learning theory to AI applications to IoT or robotics. The DLIF tutorial attracted the largest number of pre-registrants out of them. This work was co-organized by Dr. Atsunori Kanemura of AIST (National Institute of Advanced Industrial Science and Technology in Japan), also under supervision from Dr. Toshihiro Kamishima and Dr. Hideki Asoh. Preferred Networks will continue contributing to academia through open source software, research papers, and tutorial talks.